You may already be aware that MBN is seemingly selling off all their remaining inventory (a fact which saddens me greatly). There aren't many String pieces left, and most are in the smaller sizes – which is too bad, because this design does very well on dramatic curves. If you've been thinking of indulging in one of MBN's signature String styles, I'm posting this review to encourage you to go for it. This skirt is awesome with a corset, and a real attention getter as part of any outfit. The String skirt has 5 panels of horizontally draped mesh, with a slit in the center back and left front. (I note this because the first couple times I put it on, I had a hard time figuring out which way was front!) 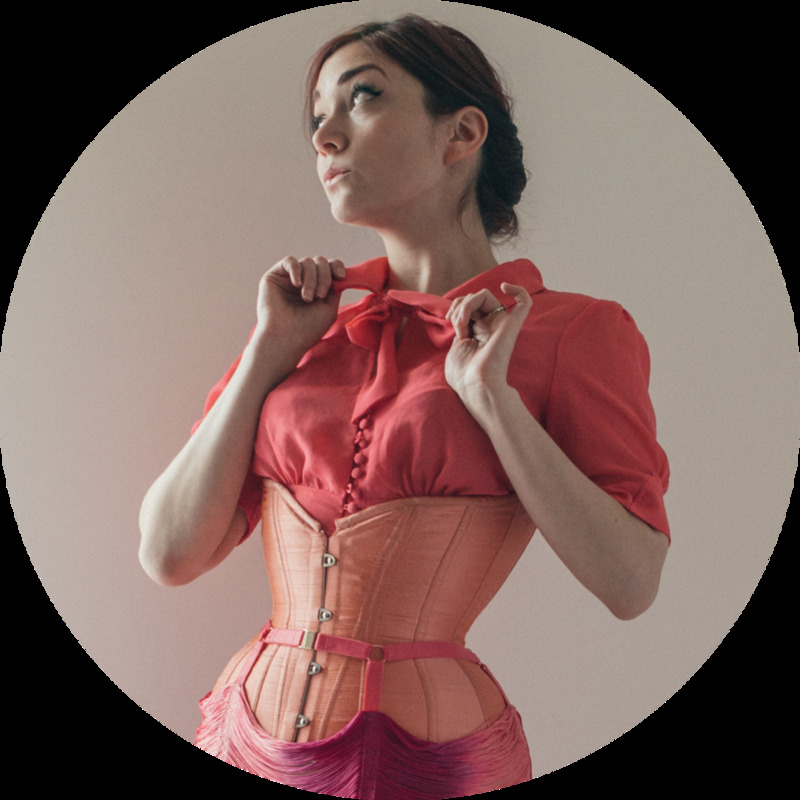 The elastic waistband is adjustable with sliders, which is part of why it works so well with corsets. At the center front of the waistband is a metal clasp. There are several reasons this skirt works so well with corsets. Obviously, the adjustable waist is a big help! But an adjustable waist alone isn't enough to make for a revolutionary fit. The second factor is the drape of the fringe – it gives some flexibility in the fit of the hips as well. So depending on your proportions, the fringe may have more tension or more drape, but it will still fit. Lastly, the "cut-outs" created by the intersections of fringe and elastic mean that it will always lay smoothly. This gives you flexibility in the shape of the hips without causing any weird bagging or cutting in. I usually style this skirt with either leggings or opaque tights. It works well whether your corset is stealth or exposed. It's comfortable, and even if I decide to take my corset off partway through the day, I can simple relax the waist sliders and keep on keepin' on with my outfit. The ombre fringe is really amazingly multi-tonal, which makes it easier to pair with a range of colors. So, yeah, even though it is a ridiculous piece of transparent clothing, it's amazingly versatile and I've gotten a surprising amount of wear out of it. Speaking of wear, how does this skirt hold up? Well, I have a bad habit of tucking my feet up under me when I sit. So I've snapped a few of the fringe by catching them on my heel. However, the damage isn't really noticeable. Any lost strands blend in. When I'm not wearing it, I take care to hang it such that it should be safe from snagging (on other hangers or clothing). I would say it probably loses fringe at a slower rate than the fringed robes I have. Made By Niki still has the String skirt in 6 color ways, currently for sale for £60 (most marked down from £189). This price is a total steal. The largest size left is a UK 12. Because of the adaptable sizing, I recommend purchasing based on your hip measurement. (Not the "top hip" on the size chart, but the [full] "hips.") I bought a UK 10, as my hips at that time measured about 37-38". What do you think of the MBN String skirt? Would you buy it? Which is your favorite color way?